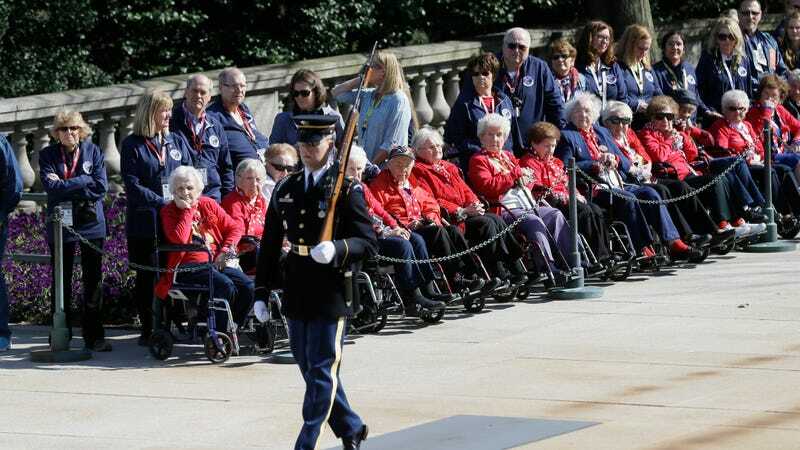 Former Rosie the Riveters watch the Changing of the Guard ceremony at the Tomb of the Unknown Soldier at Arlington National Cemetery, Tuesday, March 22, 2016 in Arlington, Va. Photo: AP Images. Naomi Parker Fraley—who as a young woman took up war work shortly after Pearl Harbor and boasted perhaps the single best case for having inspired the iconic “We Can Do It!” Rosie the Riveter poster—has died at 96. The New York Times recounted Fraley’s story in her obituary. Really, there were several Rosies. Long Islander Rosalind P. Walter inspired “Rosie the Riveter,” the song where the name first appeared; Vermonter Mary Doyle Keefe was the model for Norman Rockwell’s famous Saturday Evening Post cover. But perhaps the best-known Rosie is the one depicted flexing in a polka-dotted bandanna on a poster by a man named J. Howard Miller, which was displayed at Westinghouse Electric Corporation factories in 1943. Rediscovered in the early 1980s, it quickly became a popular feminist symbol that’s been repurposed countless places. After the Japanese attack on Pearl Harbor, the 20-year-old Naomi and her 18-year-old sister, Ada, went to work at the Naval Air Station in Alameda, among the first of some 3,000 women to do war work there. The sisters were assigned to the machine shop, where their duties included drilling, patching airplane wings and, fittingly, riveting. It was there that the Acme photographer captured Naomi Parker, her hair done up in a bandanna for safety, at her lathe. She clipped the photo from the newspaper and kept it for decades. “I even got fan mail,” Mrs. Fraley told People magazine in 2016. While Fraley is perhaps the best candidate for the “original” Rosie the Riveter, the name has been embraced by many women who did wartime industrial work, coming to symbolize the contributions of a much larger group. And in its afterlife as a feminist symbol, the poster has come to symbolize even more things to even more people. Read Fraley’s story—and the broader story of Rosie the Riveter—here.